Unless you are part of the industry, railroad siding isn’t something you are likely familiar with. If you are knowledgeable about rail siding, then you know something about this emerging means of transporting goods. So, what makes rail siding worth mentioning? Well, it’s fast becoming a regular means of transporting goods including industrial materials, food, cargo, and shipments. The possibilities are almost limitless since train cars can be altered to fit the needs of your company. The way in which a business transports their goods is vital to their effective operations. Most of your public warehousing decisions will probably be made based on the category and quantity of products you plan to store. Rail siding is just one more tool you can now use to make the best decision for your particular product’s needs. By definition, railroad siding is a small stretch of railroad track that is used to store rolling stock or enable trains to pass through on the same line. Railroad-siding warehouses are specific locations meant to store and transport goods from one region to another. 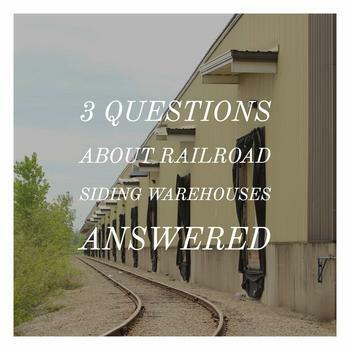 Warehouses that contain rail siding have a direct access to trains that carry shipments from point A to point B. Rail siding makes accessibility and proximity to the warehouse that much easier, removing the need for any additional transportation. So not only does rail siding make distribution that much simpler, but it also affects the bottom line regarding transportation costs. This can be particularly enticing for businesses that are undergoing a growth, whether it be in quantity of goods or acquiring new contracts from companies looking to distribute their products. Some of the pros to using rail-siding warehouses are central locations and expedition of services. The benefits of utilizing the freight systems aren’t just specific to big or small businesses; there are numerous public benefits including the decrease in road congestion, highway fatalities, fuel consumptions, logistics costs, and public substructure maintenance costs. This all means that the public might actually be appreciative of your choice to go with rail siding versus trucks. There are numerous advantages to using rail siding, and after much research, hardly any cons. In fact, none could be found except for a few minimal complaints that had more to do with specific businesses than the use of rail siding. Will my cargo arrive faster? With the number of warehouses in the United States, freight is still a relatively underutilized means to transport merchandise and products across great distances. The plus side of the railway is that most anything can be shipped by rail. While trucks can be a good solution for goods traveling short distances, the farther a product needs to travel, the better a solution railway can become. Many companies are still hung up on only transporting goods through the use of trucks, but freight opens up many different doors for transportation. It provides some cost-saving measures through fuel usage. Railroad-siding warehouses are a great way to facilitate your logistics. Many people outside of the industry have never even heard of their use, but those in the know are certainly utilizing it to their advantage. Railroad siding may not be an option for every business, but it is certainly something to research if you think it could be beneficial to your company. Call 732-287-5005x14 now to learn more about how Quality Warehouse can help store your goods in New Jersey!